If the only thing you enjoy making for dinner is reservations, maybe you need some help in the kitchen. Of course, it would be nice to have a personal chef. But for most households, having an efficiently organized place to prepare meals is perhaps a more realistic kitchen-help alternative. Nowadays there are "kitchen helpers" designed to make the most of virtually any type of space. No matter how large or small your kitchen is, there's a good chance it has some under-utilized space hiding in plain sight. Walls, doors, ceilings, floors — all surfaces, not just cabinets and counters — have the potential to provide storage. You don't have to remodel, either; the trick is choosing the right storage solutions for your kitchen needs. What follows is an overview of the best options for keeping meal-making ingredients and utensils handy. Even "convenience foods" become inconvenient when they're a cluttered jumble of cans, jars, bottles, boxes, bags and packets. A well-organized pantry lets you easily view and quickly access your inventory of packaged ingredients. A pantry is simply any place where nonperishable foods and condiments are stored. The separate pantry room (essentially a walk-in closet lined with shelves) used to be a commonplace element in houses, and this concept is now experiencing a renaissance in newer dwellings. But in most homes today, a pantry is often just a closet or cabinet in the kitchen area. • Pantry caddies are rolling shelf units designed to fit in narrow spaces, such as the gap between a refrigerator and cabinets. Shelves are "lipped" to keep items from falling off when the unit is rolled out. At 56 inches high, the six-shelf Thin Pantry Caddy ($100, www.improvementscatalog.com ) is the tallest version; it's 9 ½ inches wide by 24 inches deep, and available in white or oak finish. If you need a narrower, more compact unit, the three-shelf white melamine Roll-out Laundry Caddy ($50, www.taylor-gifts.com ) is a mere 8 inches wide by 31 inches tall by 25 inches long. 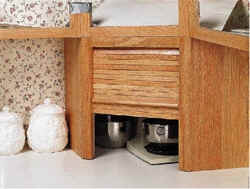 • Over-the-door and wall-mounted racks are another efficient way to “pantrify” your kitchen. The Over-Door 5-foot Rack ($18, Target) has six white coated-wire shelves, each with a 2 ½-inch lip; the entire unit measures just 5 inches deep by 64 inches high by 19 inches wide. The Container Store (www.containerstore.com ) also carries a selection of different wall- and door-mounted pantry racks in various sizes and styles. • Turntables, commonly known as Lazy Susans, have long been used for accessible storage in deep corner spaces below or inside cupboards. 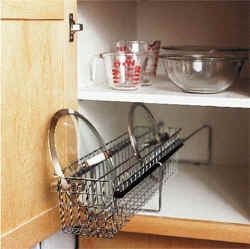 A new twist, so to speak, is the chrome-plated Telescoping Kitchen Counter Rack ($25, www.shopgetorganized.com ), which features two 12-inch-diameter racks that revolve on a 19-inch-high pole. More high-end versions in a range of sizes, materials and prices ($72 and up) are made by Rev-a-Shelf and may be found at Home Depot, Lowe’s, and online retailers such as www.ovisonline.com . • An appliance garage is a countertop device featuring a tambour (roll-down) door designed for concealing bulky, frequently used items that tend to live on kitchen counters (e.g., blender, mixer, slow-cooker). Because it converts the space between wall cabinets and base cabinets into storage compartments, this type of unit requires installation. Prices start at around $90; a good source is Rockler (www.rockler.com or (858) 268-1005). 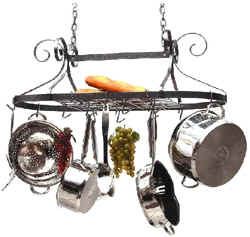 • For keeping pots, skillets and other types of utensils accessible without using counter or cabinet space, hanging pot racks are a popular solution. They come in a seemingly infinite number of styles — some feature a shelf or include lights. If your wall space is limited, the ceiling-mounted variety is ideal. You can find them at many housewares retailers, including J.C. Penney and Kmart, starting at under $100. There also is an outstanding collection starting at $150 at www.potracksgalore.com . • If your pot lids have a tendency to go AWOL, the chrome-plated Cookware Lid Rack ($20, www.cooking.com ) may help keep them at your fingertips. The 6-inch-wide, 22-inch-long slide-out rack holds four to eight lids and prevents them from getting lost at the back of a cabinet. HARRIET SCHECHTER is founder of The Miracle Worker Organizing Service and author of three books, including “Let Go of Clutter.” Her online advice column is at www.MiracleOrganizing.com .